"You're the best thing that has happened to me today!" Today was the date of the 14th annual 'Chocolate Sunday' fundraiser for the Cat Guardians Animal Shelter. I have been attending these events for many years and always have a great time. For a donation at the door, you can eat all of the chocolate and sweets you want and, believe me, your sweet tooth will be well satisfied at this event! Feral Fixers was well represented at this event. Pictured in the photograph, from left to right, are Mary Rosa (one of our volunteer caretakers), Tammy McAuley (Feral Fixers President), Chris Wallbruch (Feral Fixers Secretary and also a long-time volunteer at Cat Guardians) and yours truly. Chris is holding the basket that Feral Fixers donated for the Chocolate Sunday's Silent Auction. One of the best things about going to such 'cat-friendly' gatherings such as this one is the chance to meet old friends and to make new ones. Tammy's reputation as a 'cat guru' precedes her wherever she goes and this event was no exception. After meeting someone who was having 'feral cat issues' and being able to offer her some help, Tammy was told by this person that "you're the best thing that has happened to me today!" Rating Tammy's help above all of the sweets at this event is high praise indeed! Cat Guardians is a no-kill cat shelter located in Lombard, Illinois. They have been in existence for many years and are a wonderful group. 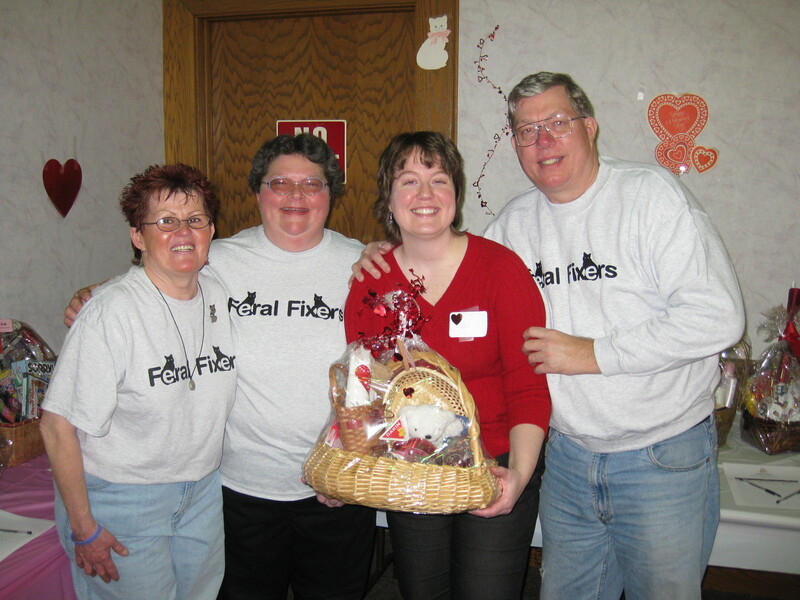 Feral Fixers has worked with them in the past and looks forward to doing so again in the future.